Responsible farming means safe, healthy milk. As dairy farmers, we love what we do. We devote our lives to working hard building an amazing life and future for our family. We dream of the day that we can pass this first generation dairy farm to our children. To make this dream a reality, we have to make sure the care of our cows is our number one priority. Be boringly, and reassuringly, predictable. Keeping our cows healthy is our main goal. We start where all good dairy farmers begin: with a consistent milking schedule so our cows are milked on time, twice a day. Cows are creatures of habit and they thrive with a consistent routine. Keep it clean. While they are being milked, we clean the entire barn. The barn is cleaned by tractor, the stalls where they lay are cleaned manually with a rake, and fresh pine shavings for comfy bedding are added weekly. Give nutritious food. Each day, we give our herd a specialized mixture of alfalfa hay, alfalfa silage (fermented hay), a mixture of grain, vitamins and minerals. And, access to fresh, clean water is crucially important to keeping our girls healthy. Reduce stress. Like humans, cows are sensitive to their physical environment. Keeping their schedule consistent, their stalls clean, and their diets healthy adds up to less stress. Take care of them when they get sick. Even with all the work that I just mentioned, as well as keeping their environment as stress free as possible, things can still go wrong. No amount of care and back scratches can keep everyone healthy all the time. Occasionally a cow will get sick and it is our responsibility to get her back to good health as soon as possible. We can provide lots of “over the counter” care ourselves. Just as some parents offer a gummy multivitamin to their kiddos at breakfast, sometimes our cows just need some extra vitamins and minerals. We also know that there are times when a cow just needs extra recovery time after a hard labor, so we let her rest. Or, a calf might need some electrolytes if it’s sick and/or dehydrated, just like children sometimes sip Pedialyte after a stomach bug. We take every situation as it comes, and most of the time our vet doesn’t need to get involved. But sometimes, we just can’t resolve an animal’s health issue on our own, just as parents can’t always make a cough go away with rest and a humidifier. For those times, we always call in the veterinarian, which occasionally means a prescription for antibiotics. This is where having a close relationship with our veterinarian comes to play. With most antibiotics, we are required to have a prescription from our veterinarian. Once we have identified the illness, we can determine which antibiotic (if any) is best used. This is key because every single antibiotic used for livestock is regulated with what’s called a “withdrawal period”—the amount of time between administering an antibiotic to the animal and when that antibiotic has made its way out of the animal’s body. Now, remember what I said about a consistent schedule? Well, a dairy cow has to be milked every day, regardless of whether she is ill or treated with antibiotics. Not milking would cause stress and other health issues. We separate any cow being treated with antibiotics during the treatment and antibiotic withdrawal period so that her milk isn’t mixed in with the milk from the rest of the herd. Why do this? Because the quality and safety of our milk is as important as the health of our cows. The two go hand in hand. This is where testing plays a huge role in our lives—and our livelihood. Here’s how testing for antibiotics works: Our milk is picked up at the farm each day, and a milk sample is taken to test for overall quality as well as the presence of antibiotics. At the processing plant, the entire truck of milk is tested for antibiotics. If the test shows positive, the entire truck load is disposed of and the farmer responsible has to pay for all the tainted milk. None of that milk every enters the food supply chain. At the end of the day, we want to make sure the food that we are providing for others is safe and wholesome. And it matters greatly: this is what we do for a living, to provide for our own family. As dairy farmers, we take great pride in what we do. And we feel so confident in the rigor of the safety and quality measures we have in place, we feed our family the same dairy products we sell on the market. Design of the Kuhn Cutter Bar. These disc mowers now come with the 100 series cutter bar with PROTECTADRIVE safety. The beveled knives with bolt attachment, the oval shaped discs converging rotation, the small distance between the compact cutter bar and the rear tractor wheels as well as the suspension spring, all these features contribute to producing highly nutritional forage without impurities which increases the herd’s productivity. For increased safety, and to prevent from any contact with the ground, the swath board has been replaced with a swath wheel. 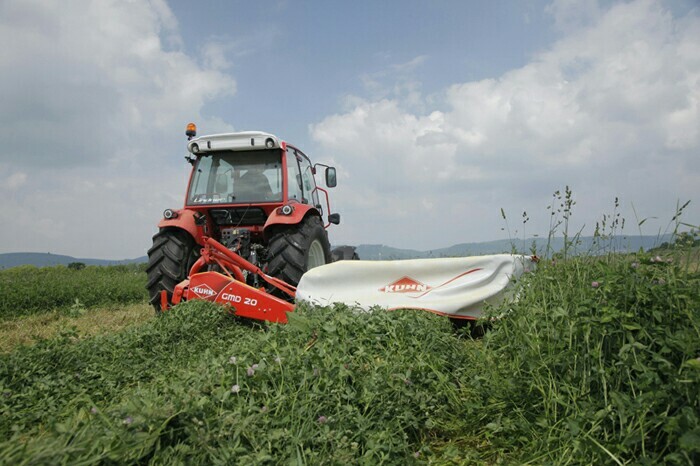 The tractor right wheels do not roll over the mown forage. The lateral cutter bar articulation allows good ground following even when mowing on embankments and ditches. Should the cutter bar hit an obstacle, a safety break-back causes the mower to shift rearwards thus highly reducing damage risks. The disc bearing station can be removed and mounted quickly and easily. A possible repair is carried out at reduced costs from the outside with minimum downtime.